You don’t hear too many people complain that they can’t stand being in their bedroom, family room, or dining room. But when it comes to the kitchen—often considered the heart of the home—it seems people either love theirs, or they desperately want to make some changes. As for your home’s resale value, potential homebuyers definitely place the quality of the kitchen high on their list of priorities. 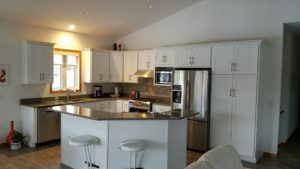 Sauk Prairie Remodeling helps create kitchen spaces that fit the unique style and needs of each customer. We want your kitchen to provide years and years of beauty and practical enjoyment. Your kitchen will get the careful attention it deserves when you work with SPR. We assist homeowners from the initial stages of kitchen design all the way through final construction. Have a window project you’d like to discuss with us?